One hundred years ago a Belgian chemist named Leo Beakeland (1863-1944) invented Bakelite. Leo Beakeland came to America and made his career as an inventor. His first invention was Velox photo paper, which he sold to Eastman Kodak in 1899 for one million dollars. With the money from that invention, he was able to buy a laboratory in Yonkers, New York and it was here in 1907 that Bakelite was invented. Beakeland is often considered the "father of plastics" as a result of this invention. The first synthetic plastic to come on the market, Bakelite was easy to mold and shape and was used in tens of thousands of household items as well as in industry. Bakelite was used to manufacture everything from telephone handsets and costume jewelry to engine parts and insulation for electronics. One of its original uses was for pool balls. Leo Beakeland's patent for Bakelite (phenol-formaldehyde resin) expired in 1927 and this opened the door for real competition. In later years Union Carbide took over Leo Beakeland's factory. During the 1930s Bakelite and other plastics changed the world. DuPont's nylon soon replaced silk in women's stockings, catgut in tennis rackets and musical instruments, steel in machine bearings, wire insulations, umbrellas parachutes etc. In the 1920s and 30s Popular Science type magazines described plastic as "a product of utopian magic, creating an artificial world of transcendent beauty and perfection from earth's commonest elements." DuPont coined the phrase, "Better Things for Better Living …Through Chemistry." This phrase was also popular in the 1960s but for a different reason! Bakelite's side trip into the tattoo world was less exciting. The story goes that when suppliers and machine builders were not able to get metal for frames because of wartime shortages, Bakelite filled the bill. Bill Jones may have been the first to build a Bakelite tattoo machine but his cast round and square back machines were so popular his Bakelite model did not catch on. Milton Zeis was a fan of plastics and produced at least two different machines using this material. 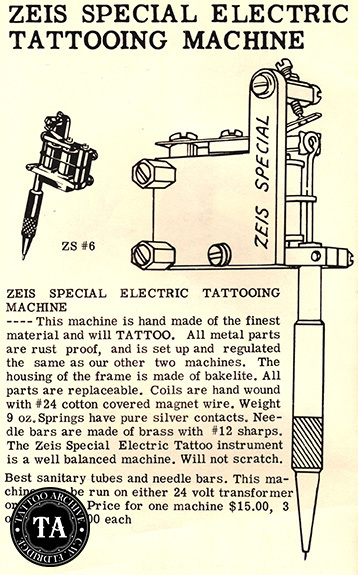 The Zeis Special ZS#6 was a combination Bakelite and metal machine. The base plate and back spring mount were made of iron and the side plate was black Bakelite with a great yellow and red ribbon decal that said, Zeis Studio, Rockford Ill. As a matter of fact, Zeis had a matched set of machines, tube grips, switch board and foot switch all in black Bakelite. Zeis also produced left-handed and right-handed plastic side plate machines. These machines may have sold as cosmetic machines and animal markers. This plastic machine had the same base plate and back spring mount as the Bakelite machine. Milton Zeis stated that during World War II he redesigned one of Bill Jones machines and came up with the ZS#6. In 1941, 1500 complete machine parts were made and they lasted until 1966. 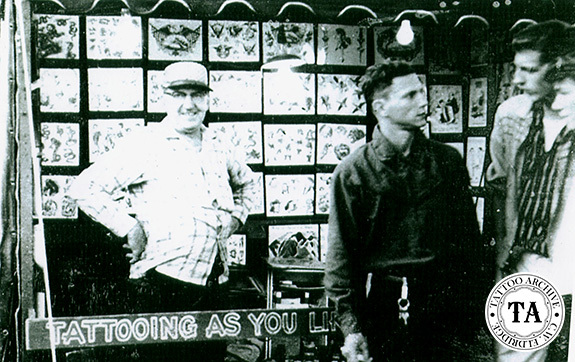 The last machine was given to Lyle Tuttle for the Tattoo Art Museum. Zeis went on to say that the first two machines sent out went to Max Pelz. When he returned them to us we thought we were stuck with 1500 machines, but they only lasted 25 years!